Nothing beats the convenience of an automatic coffee maker. Especially in the morning when all you want is COFFEE and MORE COFFEE. There are hundreds, possibly thousands, of coffee makers on the market. But not all coffee makers are created equal. Some make truly terrible coffee. Which is why choosing from the list of SCAA certified coffee makers is the only way to ensure you drink great coffee every day. So if you are looking for the best coffee maker for home, read on. We review 6 of the best SCAA coffee makers on the market today. Despite the hefty price tag, the Technivorm Moccamaster is our top pick. Simple to use and built to last, it produces an excellent cup of coffee, every time. The Specialty Coffee Association (SCA) is a membership trade organisation who’s primary goal is to define and improve coffee standards. One way they do this is through coffee maker certification. To help consumers (you and me) filter through hundreds of options they have defined specific criteria that will produce a great coffee. Through the certification process coffee makers are tested and re-tested against these criteria to ensure they meet the defined standard. One point to make is that coffee makers approved by the SCAA tend to more expensive than your average drip coffee maker. The requirement to heat water quickly, retain a constant temperature and keep the coffee warm results in higher product cost. 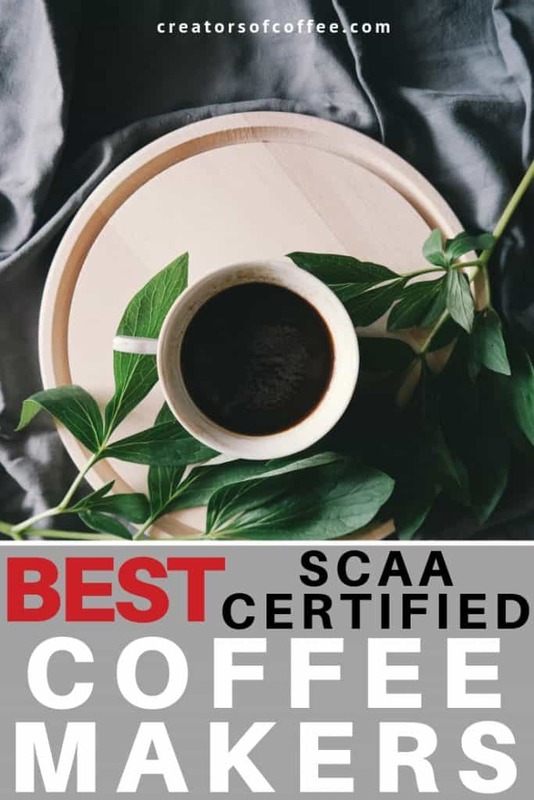 But you can be assured that when purchasing an SCAA approved coffee maker you are buying a high quality machine that will deliver a delicious cup of coffee every time. All current SCAA approved coffee makers are listed in the comparison chart below. Click here for a full side by side feature comparison. We compare and review the best coffee makers from this list in detail in the section below. So what criteria do SCAA recommended coffee makers need to meet? You can read the requirements document in full here, but we have summarised them for you here. The brew basket must be able to accommodate the golden cup ratio weight of coffee per maximum capacity without overflowing the basket. What’s the SCAA coffee to water ratio? It is 55g of coffee per litre or 2 tablespoons for every 6 oz of water. Water must not be in contact with the coffee grounds for less than 4 or more than 8 minutes. Water must reach 197 degrees Fahrenheit within a minute of hitting the grinds, maintain that minimum temperature through the cycle, and not exceed 205 degrees Fahrenheit. This requirement is about the quality of the extraction and producing a balanced brew. Technically it is described as “for a beverage strength (solubles concentration) of between 1.15% and 1.45% resulting from an extraction (solubles yield) of between 18.0% and 22.0% from the weight of coffee in the brew basket”. The results need to be replicated across a number of machines a number of times. All the coffee in the brew basket must be wetted during the first minute of brewing. No excessive sediment must settle in the carafe. The carafe needs to hold the maximum reservoir volume plus hold the temperature at 176 degrees Fahrenheit for 30 minutes after brewing. All of the drip coffee makers on the SCAA certified list meet the technical requirements. But don’t forget there are a number of personal requirements you need to weigh up when choosing which SCA coffee maker is best for you. How important is it for you to be able to set a timer? Some SCAA rated coffee makers simply have an on/off switch, others allow you to program the machine to start at a later time. Would you like more control over the settings for water temperature or infusion time? Not all auto drip coffee machines are alike so check what settings are available to find one that suits you. How much space do you have on your countertop? Some of these machines are WIDE and TALL. Make sure it will fit where you want it to go. How much do you have to spend? There is a large range of price points. Sometimes the easiest way to choose is to set your price point and choose from the makers in that range. There are pros and cons to both glass and thermal carafes. It comes down to personal preference. Decide which you like to make your short list. If time is of the essence, shortlist your machines based on brew time. The SCAA coffee makers brew time ranges between 4-12 minutes (including time to pre-heat the water in the reservoir). 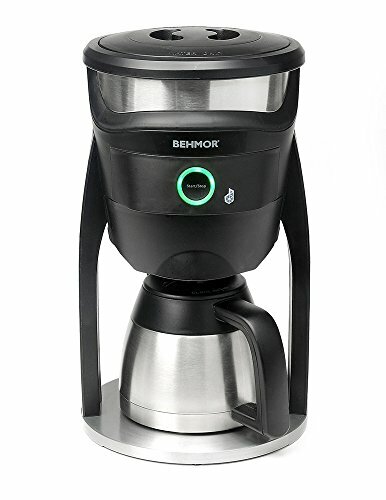 The Behmor Connected 8 cup Coffee Maker with thermal carafe is the most technologically advanced SCAA coffee maker controlled with a unique mobile app. We love the fact the water is pre-heated in the stainless steel reservoir to maximise temperature consistency and has a large oversized showerhead for optimum grounds saturation. The Behmor produces an excellent, well extracted and flavorful coffee. Brewing 8 cups in 12 minutes, it is slower than other SCA certified home brewers due to the fact the water is pre-heated in the reservoir. This feature enhances the brew extraction quality due to its consistent temperature and with programmable start and brew delay functions, this slower brewing time shouldn’t be an issue. The most unique design feature about this SCA certified coffee brewer is the mobile app. The app controls brewing temperature, pre-soak time and brew delay functions. All customizations need to be set up via the app, and then you are good to go with one touch button control or even from the app! The coffee maker can even connect to Amazon’s Dash Replenishment system to automatically re-order coffee beans when you are running low. You can ask Alexa to brew your morning coffee for you! If you prefer a simpler machine without the need for wi-fi connectivity, a great choice is the Behmor Brazen Plus temperature control coffee maker. The Behmor Brazen Plus is SCAA certified with the same brewing functionality as the Behmor Connected and is a great coffee maker without the app. Click here to read more reviews on the Brazen Plus. Both machines are tall at 15″ high. The reservoir is topped up from above so high cabinet clearance is required or you will need to pull it out from under the cabinets to refill. One thing to be aware of is that the Behmor Connected Coffee Maker can only brew 6 or 8 cups, no less. Which is great if you drink a lot of coffee but may not be ideal for a single coffee drinker. Is the Behmor for you? If you are technically minded, love new gadgets and good coffee then the Behmor is the machine for you. With full control over water temperature and pre-infusion time plus programmable start and brew delay, it offers all the bells and whistles plus a mobile app to control your machine from anywhere! 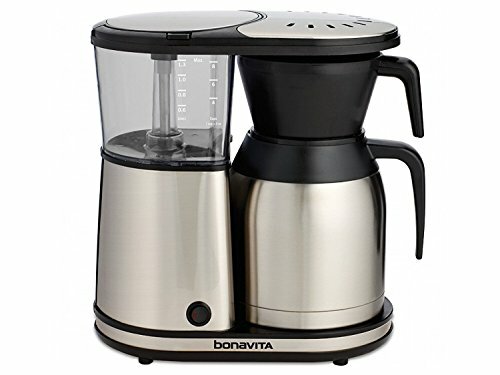 This Bonavita drip coffee maker is a simple yet high quality coffee maker. It is a compact coffee maker with consistent brewing ability and a large shower head for enhanced infusion and flavor. It features a 1500w heater and can brew 8 cups in 6 minutes. The optional pre-infusion feature (which you activate by pressing and holding the on button until it beeps) wets the grounds before brewing to further enhance the flavor in your cup. This Bonavita coffee maker does not have a programmable timer. If you need to be out the door fast in the morning and an extra 6 minutes of sleep is a priority, then check out the Bonavita BV1900TD. It is the digital programmable version of this model. The Bonavita BS1900TD 8 cup digital coffee brewer is also SCAA certified, has all the same features, just with the addition of an auto start function. Click here to read Bonavita BV1900TD reviews. For both models the carafe lid, filter basket and showerhead are dishwasher safe which makes clean up a breeze. The carafe has a wide top and is very easy to clean compared to other models in this list. One quirky design feature called out in some Bonavita BV1900TS reviews is the lid and filter basket design. Basically the lid and filter basket cannot be on the carafe at the same time. Which means removing the lid to brew, then removing the filter basket and replacing with the lid to pour. Editor’s Note: This model has been superceded by the Bonavita Connoisseur 8-Cup BV1901TS. The new BV1901TS has also been SCAA certified. While it has an improved hanging filter basket and carafe insulation, it still isn’t possible to have the lid on the carafe whilst under the filter basket. Click to read the Bonavita BV1901TS reviews here. Is the Bonavita for you? The Bonavita BV1900TS is a great choice if you have limited counter space and want a simple machine without the bells and whistles. It is one of the best drip coffee makers at this price point and produces consistently good coffee. 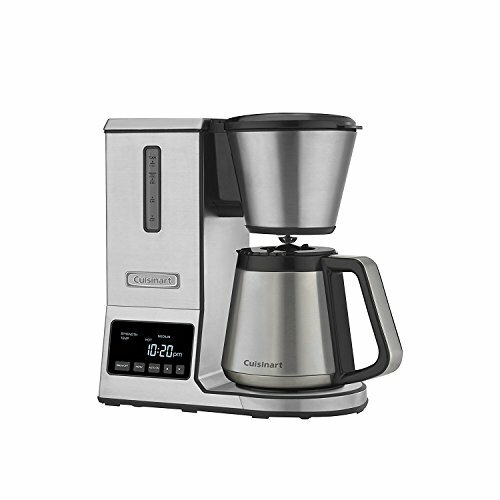 This Cuisinart coffee maker with thermal carafe allows you to create quality pour over coffee without the wait. We love its programmable flavor strength and manual temperature control plus its sleek brushed stainless steel design. Brewing 8 cups in 7 minutes, the pre-infusion function and large showerhead ensure maximum extraction and enhanced coffee flavor in your cup. With 24 hour programmable auto start capability, this Cuisinart drip coffee maker will produce flavorful coffee every time, on time. The electronic display is easy to read and simple to use. The machine feels sturdy and well made and a stainless steel cone filter basket is included. It is also compatible with #4 cone paper filters. If you don’t want a thermal carafe coffee maker, the Cuisinart CPO-800 pour over coffee brewer with glass carafe is a good alternatice. The Cuisinart CPO 800 is SCAA certified, with the same functionality, just with a glass carafe and cup warmer instead of a thermal carafe. Click here to read more reviews on the CPO-800. Both models have a self clean function and all components including the carafe, carafe lid and brew basket are dishwasher safe. The carafe has a narrow opening which can be tricky to hand wash. We suggest using a brush for this task. The main issue in Cuisinart CPO-850 reviews relates to the thermal carafe insulation. Some find the coffee does not stay hot for long. If you like to have coffee on hand throughout the day, the Cuisinart CPO 800 with glass carafe and warming plate may be a better option. Is the Cuisinart for you? The Cuisinart CPO-850 is a great choice if you like to have a programmable coffee maker with customized options, but don’t want to spend more for the Breville or the Behmor. It is the best optioned SCAA coffee maker at this price point. The OXO 9 Cup Coffee Maker is a popular SCAA coffee maker amongst coffee drinkers. With an attractive design, thermal carafe and simple control panel it offers consistent brewing quality without the bells and whistles. 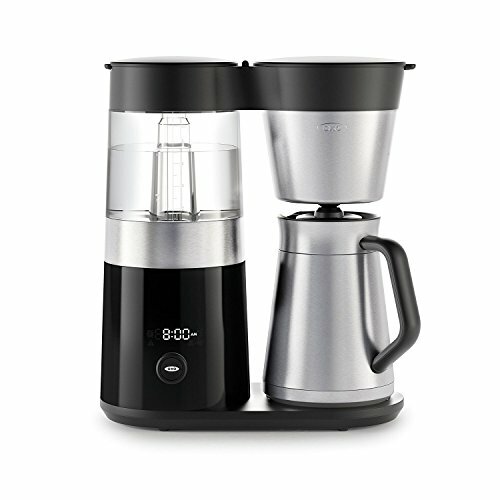 Brewing 9 cups in around 8 minutes, the OXO coffee maker gives you flexibility to brew 2-4 cups or 5 cups. The machine contains a microprocessor that controls water temperature and adjusts the brew process to account for the number of cups set to be brewed. The water is pre-heated before the showerhead releases the water and pre-infuses the grounds in the cone filter. It replicates the pour over method without a complex menu of settings. The carafe is easy to pour and the lid stays on for both brewing and pouring. In terms of cleaning, the carafe lid and filter basket are dishwasher safe, but the carafe should be hand washed. Note there is no glass carafe option in this range. Also note the OXO 12-cup coffee maker, on the SCAA certified list, is no longer sold by OXO so we have not reviewed it here. This machine is the tallest of the machines reviewed here at 17.2″ high. One thing to note regarding the OXO 9-Cup Coffee Maker is there are not many options to control temperature and infusion rate. If you would like to experiment with single origin medium and dark roast beans, the Breville Precision Brewer may be a better option. Is the OXO for you? If you love pour over coffee but lack time in the morning to prepare it, this OXO coffee maker is a great choice. With a simple control interface and programmable timer, you can enjoy pour over quality coffee every day with out the wait. 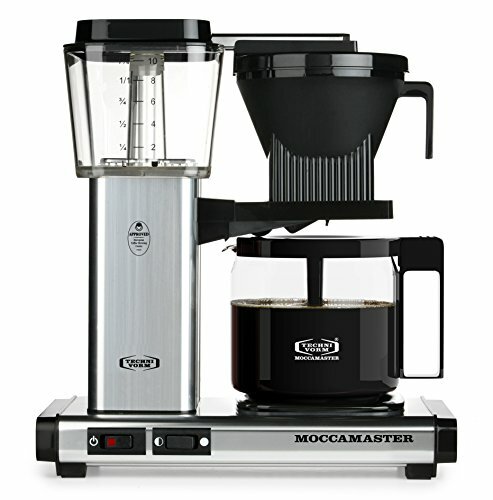 The Technivorm Moccamaster coffee maker with glass carafe is the darling amongst SCAA approved coffee brewers and one of the best rated coffee makers on the market. With a classic (slightly retro) and simple design and few bells and whistles, it is renowned for producing a high quality brew for years to come. The Technivorm is also consistently rated the best Automatic Coffee Maker by America’s Test Kitchen. There is a HUGE range of Technivorm models, with both glass and thermal carafes and even a range of colors. There is even a dedicated one cup model. All models are SCAA approved. This model brews 10 cups in around 8 minutes. With a simple on/off switch, it is quiet and quick to brew your morning cuppa in part due to the unique copper water heating element. There is no programmable timer or control over water temperature or bloom time. This model does however have an auto drip stop (brew pause) function and auto shut off after 2 hours. The Technivorm coffee maker is manufactured in The Netherlands to exacting standards and they remain one of the most loved automatic coffee makers. What it lacks in programmable features it makes up for in high quality coffee and longevity. The Moccamaster is a top coffee maker that has stood the test of time and is one of the more upscale coffee makers available. But the lack of an auto start feature at this price point is an inconvenience noted in some Technivorm coffee maker reviews. However when weighed up against the longevity and reliability of the machine, it is still a great buy. Is the Technivorm for you? This machine will produce great coffee for years to come. If you are happy to pay for a european hand made coffee maker, you won’t be disappointed. Simple to operate and quick to brew it is an excellent coffee maker for the committed Technivorm lover. The Breville Precision Thermal Brewer is the new kid on the SCAA certified homer brewer block. Just like their high quality espresso machines, this Breville coffee maker is packed full of features. We love the cold brew setting, the PID temperature control and the flexibility to use it with your favorite pour over device. This isn’t your average drip coffee maker! 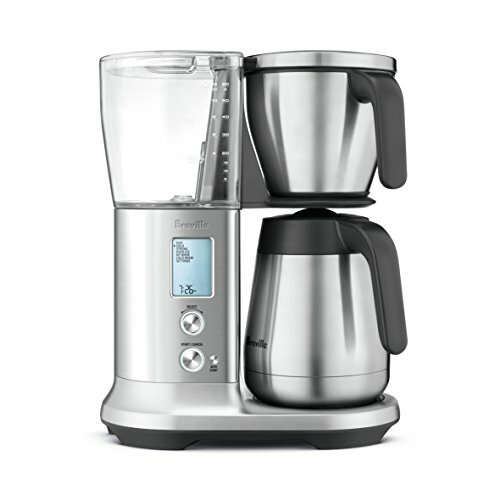 The Breville BDC450 is also the largest cup brewer in the SCAA recommended coffee maker list. This 12 cup programmable coffeemaker brews in around 8 minutes (depending on your coffee grind), this machine has 6 preset modes including Gold (SCAA mode), Fast, Strong, Over Ice, Cold Brew and My Brew (personal settings). It can detect when a single cup is being brewed without the carafe and will automatically adjust the flow settings. If you prefer glass, Breville offer the same featured coffee maker with a glass carafe and warming plate. Click here to read more Breville Precision Glass Carafe Brewer reviews. Both machines are tall at nearly 16″ high. The reservoir needs to be filled from the top and is not removable. This machine needs a good chunk of counter space. It is worth noting that while the thermal carafe keeps coffee warm for longer than the Cuisinart, it still can’t compete with the Technivorm for longevity in the pot. Also, as the machine uses a water pump, similar to an espresso machine, it runs louder than your standard drip coffee maker. Is the Breville for you? For the craft coffee lover, the Breville Precision is an excellent choice. With options for regular drip, cold brew and pour over it is more than a drip coffee maker. With a huge range of functions and settings, this machine is ideal if you want to learn the nuances of coffee making and you are prepared to tinker with the settings to dial in the perfect coffee. Prepare a cold brew with a bag of Kona coffee for the ultimate craft coffee experience. It helps to start with best coffee beans. If you have a sensitive stomach check out our short list of the best low acidity coffee beans here. For fresh tasting coffee, grind your beans at home with a coffee grinder like this one. Read the manual! Especially if you purchase a coffee maker with options, experiment to find your preferred settings. Use a scale to measure your coffee beans to achieve the golden cup standard every time. Keep your coffee maker clean. Check the manual and descale the coffee maker regularly.